As this just happens to be the first time in years I haven’t been behind a school firewall, I thought I’d do something up-to-date for once. Luckily, the world’s most respected anime-watching technique is as useful as ever! Translator’s/bloggers introduction: Some time ago, I received an email from Kaoru Kumi, a freelance writer in Japan who had read the coverage of my blog post translations of Kentaro Takekuma’s lectures (1, 2), offering the opportunity to translate portions of the anime scholar’s extensive book on Hayao Miyazaki, Miyazaki Hayao no Jidai (The Age of Hayao Miyazaki), written in the school lecture style, that contained Kumi’s own in-depth analysis of the Nausicaa manga as well as an engrossing examination of a often-used but rarely-explained term used to describe manga. Since I’ve been busy as of late, I received Kumi-san’s permission to split the translation duties with SDS of Ogiue Maniax, where the second half of this translation will be posted. I’ve tried my best to keep formatting simple, with underline used for titles, italics used for unusual Japanese words that were kept untranslated, and (Firstname) (Lastname) for Japanese names. I’d like to thank Kumi-san for giving me this opportunity and working with me throughout the translation process. Also, if you have any comments or questions, as always, please let me know. Here we go, boys and girls. (laughter) Today, I’ll be talking about my analysis of the Nausicaa manga. Not the movie, the manga. The manga was a long-running series, brought into the world in January 1982, and completed in ’94. I’ve already discussed why Miyazaki started working on this project, so I can skip talking about that today… Or so I’d like to, but if I did, I’d surely see some confused faces, so I’ll tell you about his career as a manga artist before Nausicaa. As I mentioned earlier, Miyazaki wanted to be a manga creator when he was in his teens. There’s an interview with him where he reflects on that period of his life, and I encourage anyone interested to find a copy of it1 . Miyazaki has a number of pleasant anecdotes about this period; when he was a senior high school student, he was shocked when told that his own designs and stories were copycats of Tezuka’s manga, and so he burned all his manuscripts, or about the only time during university he brought his manuscripts to a tiny publisher, but was too shy and nervous to ask them to comment on his manga. He says that he had hardly opened the door before he had left the office. His talent bloomed while at Toei Doga, after graduating from university, in the latter half of the ’60s, during which time he published two obscure manga works while he also lead a busy life as an talented animator. The first is Sabaku no Tami (The Desert Tribe), a manga–or more accurately, an illustrated story2–serialized in Shonen Shojo Shinbun, a weekly children’s newspaper,3 after he worked hard on Toei’s animated feature The Adventures of Horus: the Prince of the Sun was completed in 1968.4 I’ve come across this work on the internet once, and what struck me was how cinematic its image composition is. The story is kind of like if the Pejite tribe from Nausicaa became its main characters. The serialization was cut short mid-run, and the work has never been republished, meaning that the title remains a very rare one. The other work is his manga adaptation of Animal Treasure Island. Only a bit of this was available in a book, and furthermore I was only able to look over it briefly, but this too struck me really as a manga movie. He left Toei Doga after this period. This was the only experience he had with creating manga up to 1982. Finding out that Animage wanted to have him draw a long series must have troubled him somewhat. There are stories of him repeating many times, “Hmm, I still haven’t got the knack of the syntax of manga” as he was drawing the first chapters. 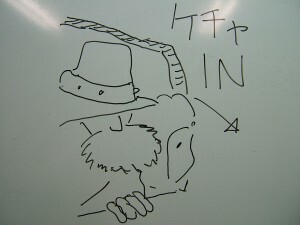 In fact, he would say that he was not sure he was able to draw manga fully with pens. You know, animators use pencils when doing line drawings, right? Being so used to working with pencils meant that he didn’t know how to fully use G pens or ball pens. 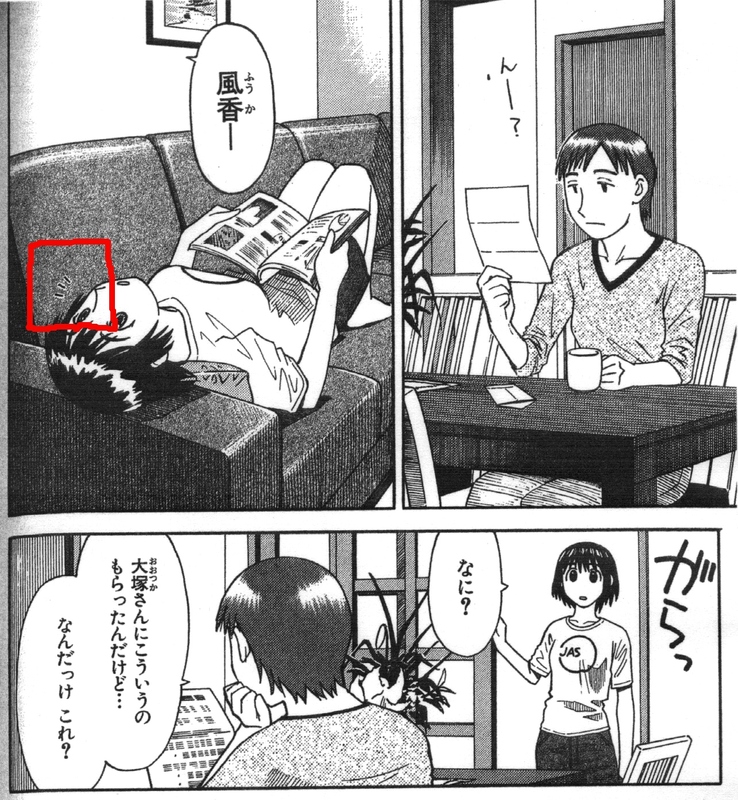 During its early chapters, except for chapter one, there are actual instances of him using a pencil to draw the manga. Of course, this is while he was working on the television series Sherlock Hound (1982), meaning that he was very short on time, forcing him to submit his completed pages in pencil, not having used pen and ink. Once he left the production team of Hound, he returned to using a pen. In Hayao no Shigoto, I did an analysis of the Nausicaa manga which garnered quite a response from my readers, but I’m actually not satisfied with my analysis. I mean, while I did tackle the composition of the story, I didn’t tackle any sort of visual analysis from a technical point of view. 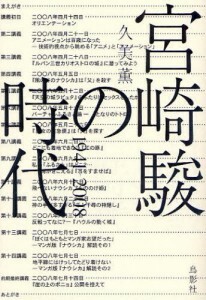 While manga criticism was once focused just on themes and ideology of the narrative, a form of criticism which adds to that approach by looking at the actual lines on the paper to understand the author’s thought process and the manga as pure image has come to the forefront since the ’90s in the Japanese manga criticism community. You all must know the television program Manga Yawa, on NHK sattelite? On the show, Professor Natsume has a segment where he does manga analysis called “Natsume no Me” (Natsume’s Eyes). Analysis like what he does. I’d been thinking for a while, “I wonder if he’ll ever do Nausicaa…” Incidentally, he still hasn’t done a segment on Nausicaa. Allegedly, Miyazaki won’t OK it. What a narrow-minded man! (laughter) Well fine, if the NHK won’t do it, I will! And with that, I’d like to talk about my technical analysis of the Nausicaa manga. As soon as the serialization of Nausicaa began, manga lovers began to praise it highly. It seems like the two things you heard the most about it were “it’s quite cinematic” and “its style is dense and hard to read.” This is the opinion of someone who read the manga before watching the movie, and I felt the same way when I read the manga for the first time after seeing the movie. Putting that aside, what exactly does “cinematic” mean, anyway? You heard the same term applied to another work that began during this period, Katsuhiro Otomo’s AKIRA, even praised as such by the man first said to create “cinematic manga” in Japan, Osamu Tezuka–though in the last 10 years of research, talented scholars have made discoveries leading manga critics to conclude with certainty that “cinematic” techniques were being used in manga before Tezuka began creating cinematic manga. But what does “cinematic” mean? You can’t pin it down. While there are a number of definitions given by a host of manga researchers, none of them sit well with me. To put it bluntly, they’re all functionally useless definitions. Well, there are some ones which are specific and pointed, but there’s always something wrong with them. “What exactly makes a manga ‘cinematic’?” I’ve always suspected that the text that can answer this question is Nausicaa. So finally, I’ve found a way to bring the answer to you, today through my technical analysis of this superheavyweight title. How smart I am, huh? (laughter) Today will be the first time that I reveal this method of analysis in public, so prepare yourselves. There’s four typical patterns of edits. Pattern A: Despite going from one shot to the next, the action continues to take place in the same location, and the subjects remain in the frame, allowing the action to continue uninterrupted. The astronaut is in the Space Pod hangar, and is about to ride a pod to go out to repair an important device of the antenna on his spacecraft Discovery (1). Look closely at the way his body moves. Even as we go from one shot to the next (2), his movements continue, totally uninterrupted. Ah, a light has turned on in the Space Pod, and something has started whirring as it moves (2′). While there’s an edit between the two shots (2′ and 3), the actors and props on screen remain the same between the two, and they continue to move in the same way, uninterrupted. This is the essential part of this kind of edit. If you still don’t comprehend what I mean, imagine a television broadcast of a baseball game. When you hear the crack of someone hitting a home run, a number of TV cameras all follow the ball. You watch the flying ball from multiple camera perspectives continuously, or uninterruptedly, on the screen. That is a typical A.
Patttern B: The setting drastically changes from one shot to the next, but the characters on screen are in both shots, and are not seen briefly during the sequence. 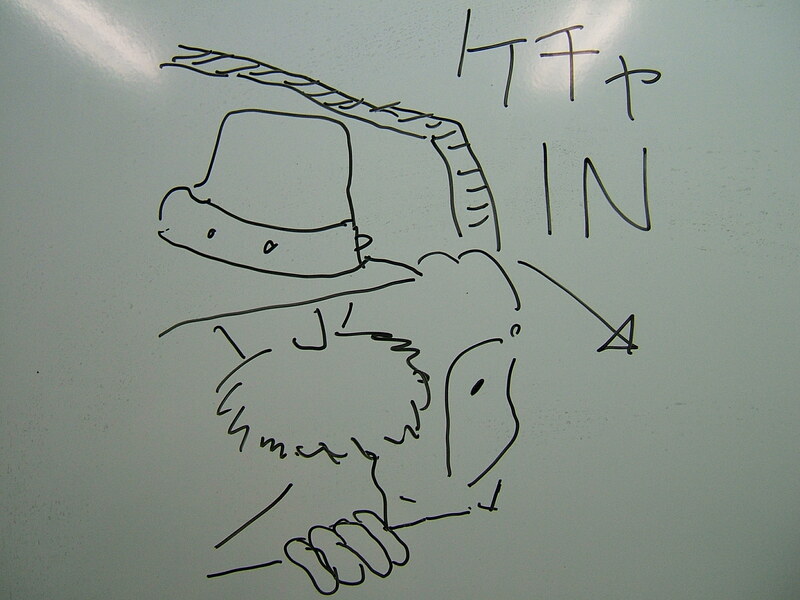 Since the actors are unseen for a moment on the screen in pattern B, then naturally, the action is also interrupted. These men take their leave once they confirm their identities. Before the two can exit from the frame (1), there is an edit, and then they exit by walking out into the space station lobby (2). This sequence occurs in a few seconds, while the actual time to travel that far would be in the tens of seconds. Strictly speaking, we would say that the action is not continuous. However, if we look at it as movement from place X to place Y, the action is continuous in a broader sense of ‘walking from customs to the lobby’. I’ll discuss this later; this is a major point. 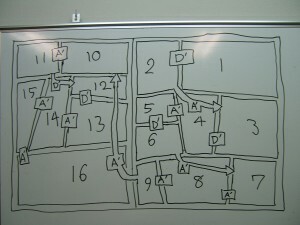 Pattern C: The film moves from one location and one set of characters to another location and another set of characters, turning into a separate sequence. They’re having a meeting at the moon base(1). And now we cut, and there’s the surface of the moon (2). A Moonbus is flying above the moon’s surface. The shot of the meeting and the shot of the moon take place in different places and times. Basically, it changes to a different scene. In a novel, this would be a paragraph break. Pattern D: An edit from one place and cast to another, then a return to the original setting and characters, used to skip the passage of time. The Space Pod is slowly moving through space (1). Then we cut to a close-up of the antenna (2). When we cut back to the Space Pod, we find it on standby near the antenna (3). In other words, the time in between shots 1 and 3 has been omitted. It would probably take a number of minutes for the ship to arrive at the antenna, but thanks to editing, it only takes a few seconds. It doesn’t feel like anything’s been abridged, though, does it? These are the four typical ways in which edits are arranged. While we are so accustomed with television and movies that we don’t even notice them, these four patterns are used in almost everything from films to TV dramas. Of course, there are plenty of deviations from these patterns. Even in this film, 2001, there are sequences edited in totally experimental ways towards the end of the movie. But what I want to get across to you is that these 4 patterns are the most basic, fundamental ones there are. Now, let’s move to the world of manga. Japanese manga is often called “cinematic,” so if that’s really true, we should expect them to be based around the four patterns above. But what’s the actual state of affairs? Let’s take a look. Let’s start with pattern A. This is Azumanga Daioh. A high school girl nicknamed “Osaka-san” is splitting apart disposable chopsticks. (2). 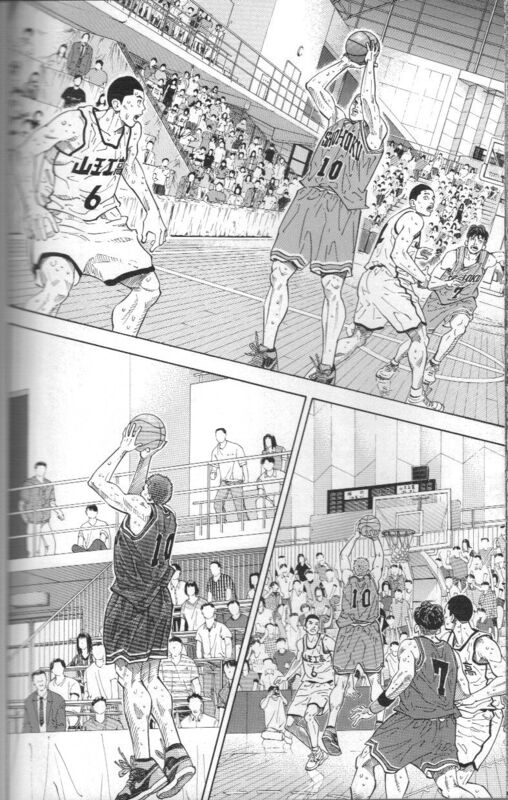 In panel 3, Osaka-san turns to face the tiny girl.7 In other words, there’s nothing omitted between panels 2 and 3. In panel 4, she’s swung around to show the girl wearing glasses how smartly she split her chopsticks. Again, there’s nothing left out between panels 3 and 4. Because manga is a medium of drawings printed on a piece of paper, we don’t actually see Osaka move, but we use our imaginations to fill in the gaps as she turns left and right. In short, this can be compared to the film pattern A. I’ll call this pattern A’ (A-dash). There’s one more pattern, A” (double-dash). Panel 1: Bam! (ばた) / Panel 2: “Let’s get ourselves back together and start yelling in time!” (かけ声かけておちつけましょう！) “That’s right, let’s take our time.” (そやな　ゆっくり） / Panel 3: “One” (いち) Bam! I’m going to say that these correspond to film pattern A, and if there’s no action omitted between panel and panel, I’ll call it A’, while A” will be if there’s one action or more omitted between the panels. Got that? I’ll repeat it again, don’t make understanding these two a mental exercise, actually use your body to confirm what’s going on. If you do, then that will make things much easier to grasp. What about pattern B? This would seem to be fundamentally impossible in manga. Take this for example. From Shirley. 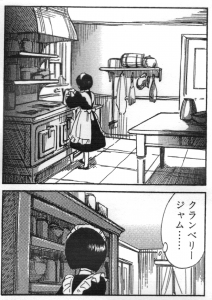 A little maid is preparing tea in the kitchen. Panel 2 takes place in the same room as panel 1, but her surroundings are different. 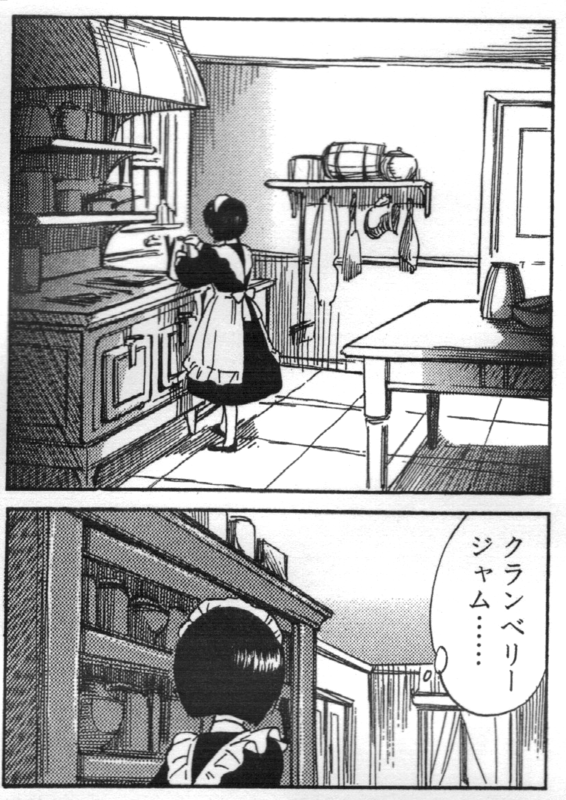 So in a film, we wouldn’t see her in panel 2 at first, and after a few moments, she would enter the frame.9 This girl is actually looking for cranberry jam, and so is moving from one shelf to the next in these panels.10 However, in manga, we can only simulate entering and exiting a frame, as these are static images. The reader must figure out what’s going on in these two panels and connect the action internally. Let’s call this B’. This is the beginning of Shin Takarajima, the legendary Osamu Tezuka manga that he drew at the age of 19. 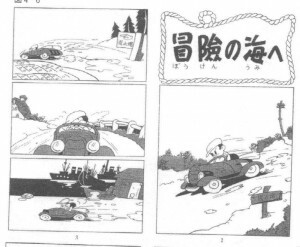 It seems to have been an extremely shocking manga to its young readers at the time, as they apparently felt that the car seemed to really be moving, despite the manga being static images on a page. While it’s still highly praised to this day, with individuals saying “it’s like watching a movie!”11, if you look at it carefully, this sequence of edits would be very strange if they were filmed. 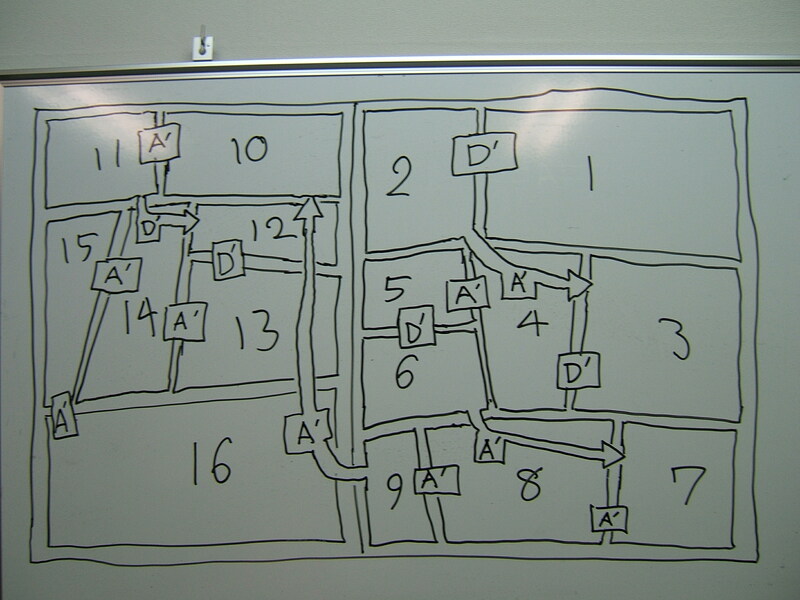 A car appears throughout panels 1 to 4. As I mentioned earlier, if there’s shots edited together where the action takes place in the same location with the same actors appearing in an uninterrupted way, then it would be pattern A. But as we go from panels 1 to 4, the actors are the same, but the scenery changes. Panel 1 takes place on a downhill road. Panel 2 is in a field. 3 is a road alongside the coast, and 4 is at a harbor. While the character’s action is not interrupted, the scenery is. Generally, films tend to avoid this style of editing. However, in manga, there is nothing strange about this. 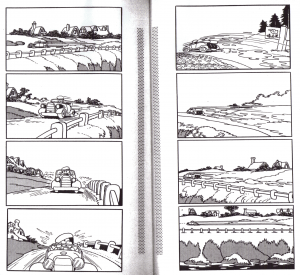 Consistent action–in this case, furiously driving a car at a high speed–allows the reader to overlook the disconnected flow of scenery. While this is similar to the A’ pattern, the character stays the same on the page while the background changes. If this sequence was to be filmed, I imagine that the character would have to be out of the frame at some point, meaning that it is closer to a B pattern. I’m going to classify this as a B” edit. I’ll be calling the kind of pattern seen in the revised edition of Shin Takarajima B”-(double dash minus), and I’d like to look at another example to illustrate my point. Pattern C is fairly common in manga, right? This is the original Whisper of the Heart. Shizuku-chan and Seiji-kun are quarreling for some reason in the library. Her father, a librarian, also appears here. After that, we see the image of falling rain, introducing a whole new scene. I’ll call this pattern C’. There are other, more subtle ways of changing scene and setting. From Golgo 13. 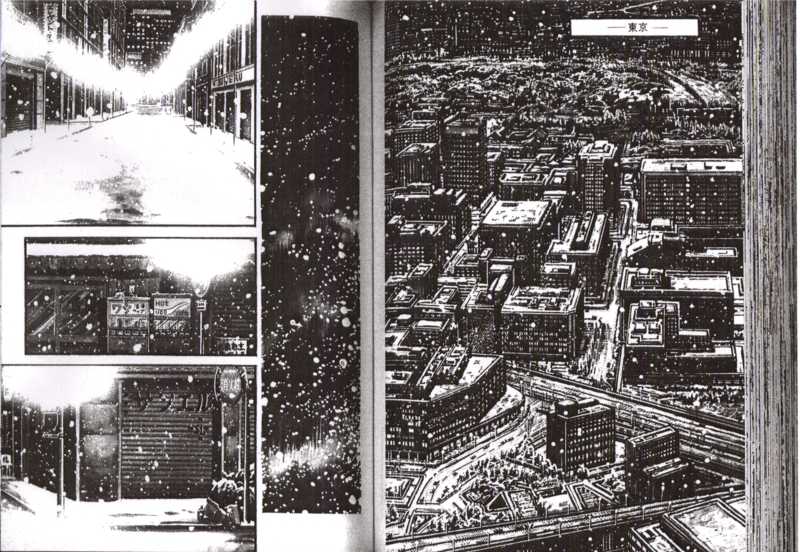 We see the streets of Tokyo via a series of panels. No one panel is directly related to the next, as their main purpose is to express the feeling of the city itself. We see this technique used in films quite a bit, don’t we? I’ll call this pattern C”. As far as pattern D, we see this quite often in manga. This is from a war manga called Zipang. It’s a SF-ish story about a state of the art Japan Self-Defense Force ship, getting sucked in by a storm and being spit out right in the middle of World War II. 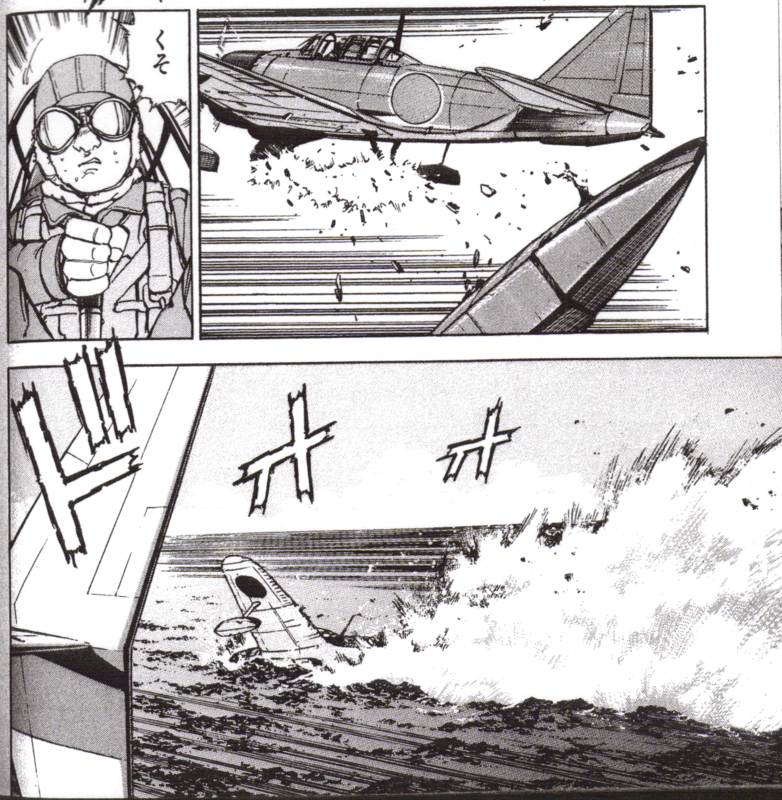 Here, a JSDF propeller plane is out on a scouting mission, is found by a Japanese Zero Fighter, and gets into a dogfight. 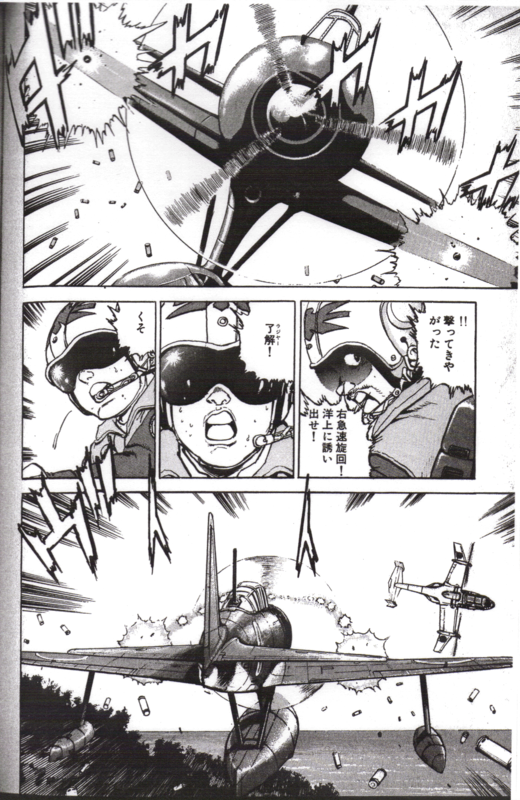 Forced to counter fire, the JSDF plane shoots at the Zero in panel 1, aiming at the float attached to the bottom of the plane. Panel 2 is a closeup of the Zero’s pilot. 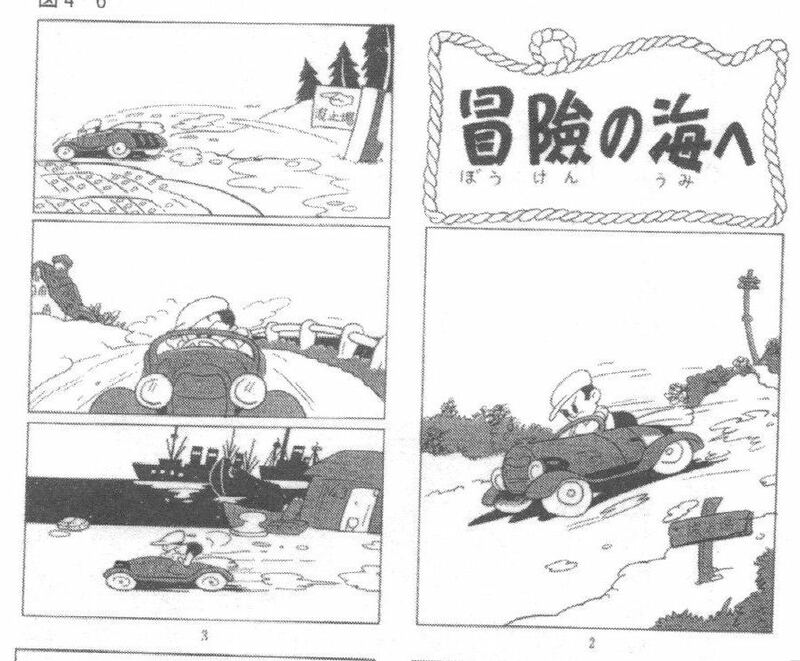 In panel 3, the Zero makes an emergency landing in the ocean, or rather, he crashes into it. 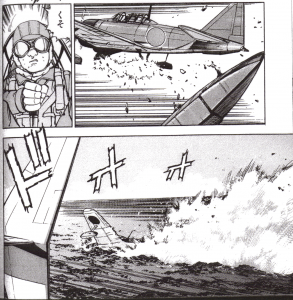 For your information, the thing you see in the left side of panel 3 is the JSDF plane’s wing. While I believe that a dozen seconds or so must take place in this sequence, we get a closeup of the pilot in panel 2, allowing the time between panels 1 and 3 to be shortened considerably in a clever way, resulting in a crisp and exciting battle scene. This definitely corresponds to pattern D in film, so I’ll call it pattern D’. Manga are still images, drawn on pieces of paper. Even so, I bet you often think “wow, this seems just like I’m watching a movie,” don’t you? Take this, for example. See what I mean? These pages go A’, D’, C’, D’, A’, D’, D’, (new page) D’, D’, A’, A’, D, and are extremely readable. When I say that these pages are nearly all A’ and D’, it also means that there are absolutely no instances of A” patterns. So what about the Nausicaa manga? Surprisingly enough, we find quite a few A” patterns used. Strangely, though, it never feels very noticeable. I found this one particularly impressive. Then we’d cut again to panel 3. Oh, sorry, I’m going off on a tangent about film editing, rather than manga, so I’ll try to get back on track. Assuming that this sequence is a B’, I can’t say it perfectly meets the requirement that in a B’ edit the subject’s action has to be continuous in a broader sense even if it is being interrupted for a second when a shot cuts to another. But, in fact, this sequence is quite easy to follow. If you’re wondering why, look at it more closely. Panels 1 and 2 take up the right side of the page, while panel 3 takes up the left side. This page almost reads like a map of the inside of the glider. Did you love illustrated encyclopedias when you were a kid, everyone? They often map out how each section or room is laid out inside a ship or a house in a single illustration. I think Miyazaki applied this style to the visual composition of this sequence–maybe unconsciously. We can see traces of Miyazaki’s childhood love of illustrated encyclopedias in this page. Let’s go back and compare it to the Master Keaton we just looked at. Theoretically, we would say that Keaton, which uses no A” edits, would be more cinematic than Nausicaa. However, if we look at the two side-by-side, Nausicaa seems no less cinematic than Keaton. Why? Look closely. Many panels in Keaton extend beyond the page. We see this four times in these two pages. On the other hand, this very rarely happens in the Nausicaa pages. 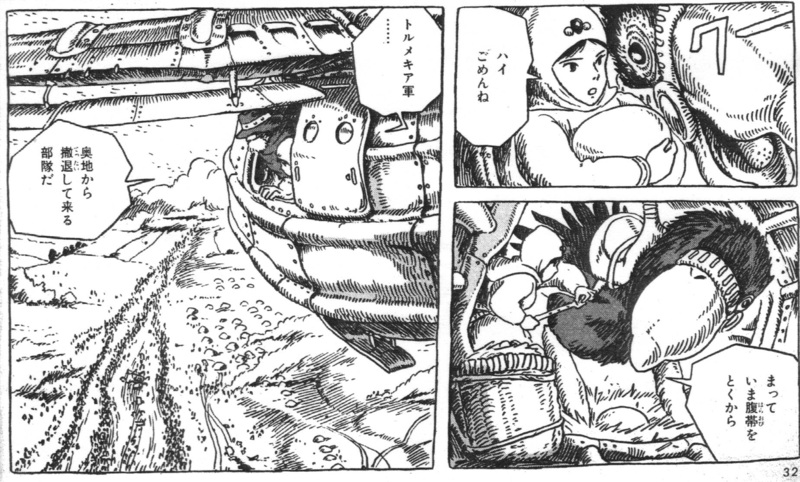 Incredibly, there are only two instances in the entire run of the Nausicaa manga where panels are not box-shaped. No matter how incredibly complicated and crowded the art gets, it’s always contained in rectangular panels. For a modern manga, this is a fairly rare, or should I say abstemious, spartan work. There’s another reason that the Nausicaa manga is cinematic. During action scenes, quite a few of the edits are A’s. Take this for example. A fighter plane from the Valley of the Wind meets a Tolmekian warplane, and they get into a dogfight. Breaking down these panels, we get D’, A’, D’, A’, D’, A’, A’, A’, (next page) A’, A’, D’, D’, A’, A’, A’. Now this is incredible. A’ edits, full throttle!18 The quick speed at which the reader goes through these panels matches the speed of the action. Furthermore, look at panels 11 and 12. Panel 11 is what Asbel, seen in panel 12, is seeing. 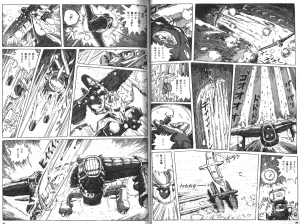 Manga researchers call this technique “character-reader unification.” 11 and 13 have fundamentally the same composition, but strictly speaking the camera is behind the fighter plane in the latter panel while the former panel is drawn from the pilot’s perspective. Since the enemy plane is larger in 13 than it is in 11, we feel like the plane is quickly closing in. 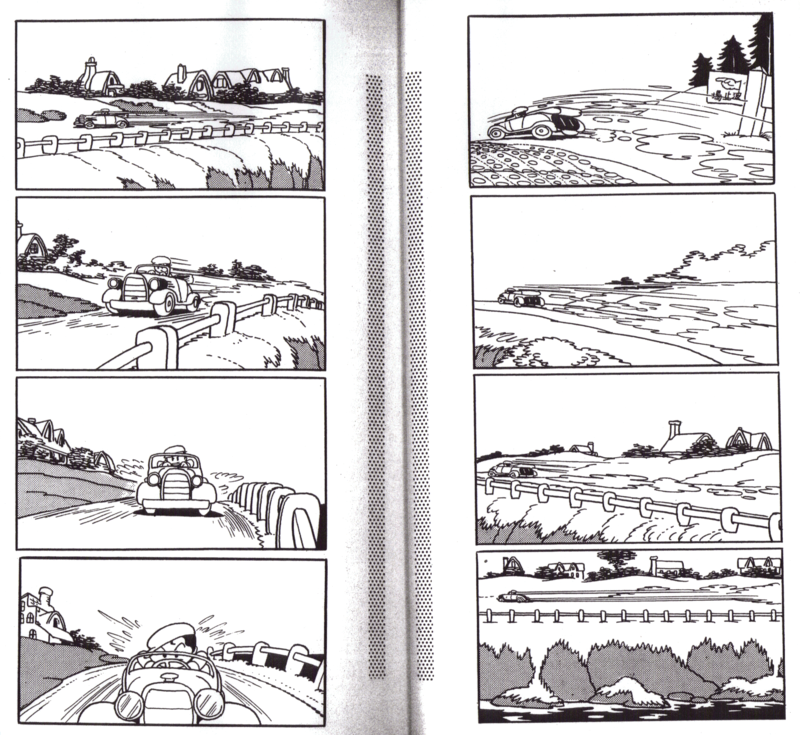 Also, supposing that Miyazaki redrew panels 11 and 13 both from the pilot’s perspective or from that of the imaginary camera following the plane in a high speed dive, skipping panel 12, this sequence would still work fine, but it would certainly lose its exciting dynamism since it turns into a B”-, or into slow motion. 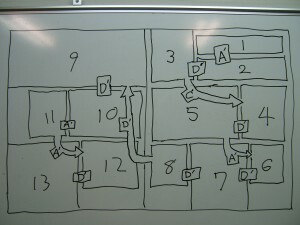 By inserting Asbel’s face between panels 11 and 13, and also changing the camera perspective, Miyazaki escapes creating a drawn-out scene that B”- sequences tend to create. A Zero fighter begins firing on a JSDF plane. If we break down the panels, we get D’, D’, A’, D’. Kawaguchi’s manga, such as Zipang and The Silent Service, are often praised as “cinematic.” However, we see surprisingly few A’ edits here. The reason behind this comes from the time schedule that this work is produced on. Nausicaa wasn’t serialized in a manga magazine, but rather an anime news and information magazine. That meant that the manga could be produced very slowly, around only 16 pages a month. Compared to that, Zipang was serialized in the weekly magazine Morning, which would call for 18 pages a week. Of course, this kind of volume can’t be produced by one person alone, and so Kawaguchi-sensei has 6 to 7 assistants in his studio, all working together to produce the manga. 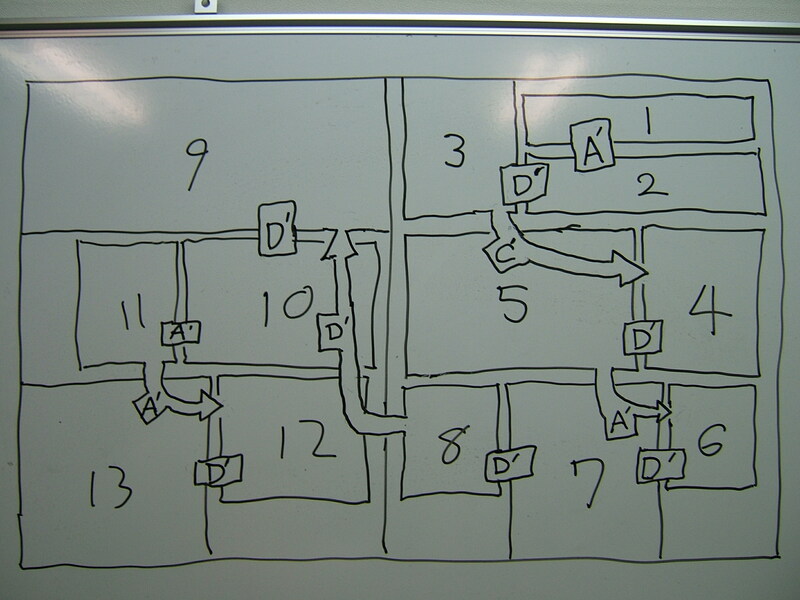 The basic sketches of the panel layout and composition, what Japanese manga artists normally call “Name”s, are created by Kawaguchi, who would also draw the main characters such as the pilots. However, things like the Zero and the JSDF plane, or the spray of the waves of the ocean would be handled by his capable assistants, using photos as reference. To make a grossly simplified classification, there are two kinds of panels here: ones that Kawaguchi penned himself, and ones that were only laid out by him that the assistants would work on, both of which would appear normally next to each other in the manga. Naturally, there will be more D’ edits. So, in both Nausicaa and Zipang, we see panels of a pilot’s face inserted in the dogfight scene. But in the Nausicaa example, doesn’t it feel like the pilot is actually a part of the plane, or rather, that the plane is an extension of the pilot? While we are shown the faces of a given plane’s pilot, whether that is Asbel or Mito or a Tolmekian soldier, it ultimately feels like we’re watching two birds engaged in aerial combat. In Zipang‘s case, the JSDF plane and the Zero both seem like plain machines, and it feels more like the pilots are the main characters of the scene. However, the techniques that these two have in common are their use of on’yu (sound effect, or “sonopher”) and keiyu (visual effect, or “formpher”). The “DAKAKAKA (ダカカカ)” and the “VUII (ヴイイ)” you see in the top and bottom panels are on’yu. We also see some strange, thin lines surrounding the plane. These express that the plane is flying at a high speed, and we call these keiyu. 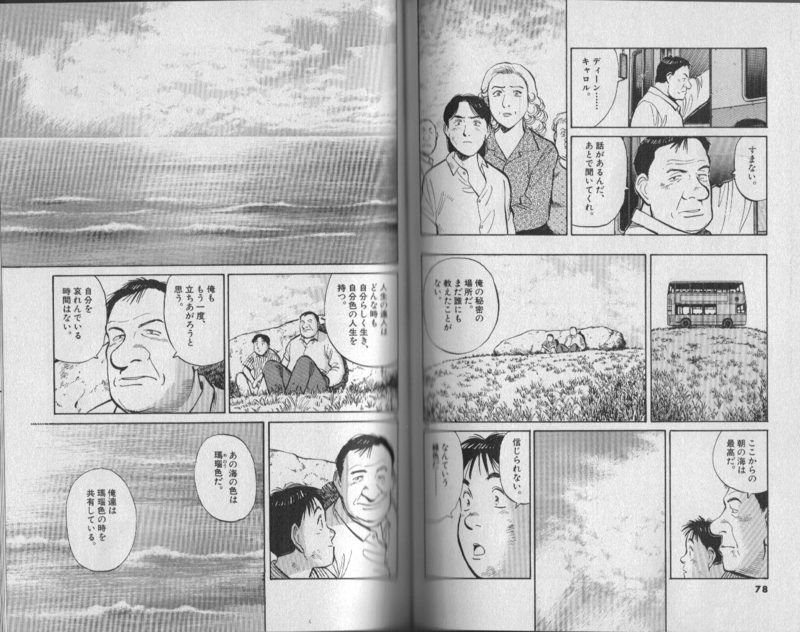 On’yu and keiyu are a vital part of what makes comics, especially Japanese manga, so dynamic. However, you have to be careful not to overuse them, or else they get in the way of the story. Let me show you an example of these techniques used in an unintrusive way. From Yotsuba&!. These are succinct and unintrusive. Nonetheless, on’yu and keiyu are being used in a very subtle way. As an experiment, let’s erase the keiyu next to Fuuka-chan’s head and the “Gara (がらっ)” on’yu in panel 3. In the original panel 2, Fuuka-chan is bending her head back when she hears her mother calling, but if we erase the keiyu in the panel, it looks as though she was in that position even before her mother called her. Thus, the relationship between panels 1 and 2 become fuzzier without the keiyu. Next, panel 3. Here, Fuuka-chan opens the door, “Gara,” and says “what?”, but if we take the “Gara” out, it seems like the door was open before she entered the room, see? To put it a different way, just by using the on’yu “Gara,” the action of “Fuuka opening the door” is expressed–the reader fills in the blank, mentally. While Yotsuba&! 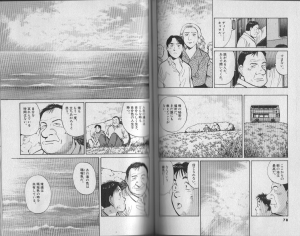 seems like a relatively simply drawn manga, it still uses on’yu and keiyu, in subtle ways. In some ways, you could consider this as a very restrained manga. Although, a surprising amount of work went into Fuuka-chan’s chest in panel 2.19 Azuma-sensei, you perv (lots of laughter). 2chan.us is a blog. You can use a feed reader to receive updates on the entries or the comments. The design is called "design" and it is by Shii's Banana Hut. 0.465 seconds just for you.